Last Night the 2012 Republican Presidential hopefuls had another debate in Rochester, Michigan. This video clip will no doubt be shown for years to come as to what not to do in a debate. If you haven't seen it yet, watch it now - it's only 60 seconds long. There's some good, bad, and ugly and very useful body language lessons here. 0:01 - 0:06 Gov. Rick Perry: He begins this clip with the MAJOR FAUX PAS, "Finger point-hand chop" (FPHC). This is always a negative nonverbal. It offends the audience and it will lose you voters/believers/employees' respect - even if they initially like you. It is universally negatively received and will interpreted as patronizing at best. If someone displays FPHC in response to an accusation (which doesn't apply to Gov. Perry here) then there is a very high likelihood of a simultaneous deceptive statement. Remember President Bill Clinton? (see "Change the Person, Time and circumstances a bit, if this were your spouse or co-worker, how would you call this?"). 0:08 - 0:16 Gov. Rick Perry: "...it's three agencies - that when I get there that will be gone, Commerce, Education, and...." At the beginning of this segment, Perry does a smart thing that most politicians don't take advantage of - he begins counting on his thumb. 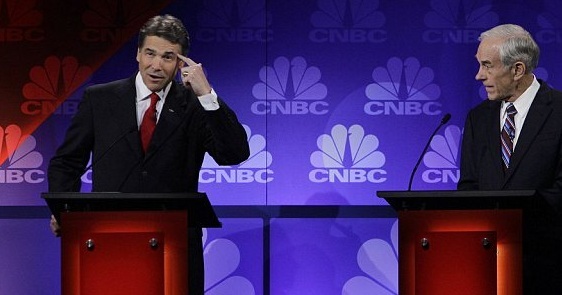 Most North Americans begin counting on their index finger (Pease) - Perry starts with his thumb. This does two things: it allows the candidate to use the thumbs up gesture first - which is a near-universal display of optimism (when they begin to count). It also simultaneously avoids the pseudo-point when counting with the index finger first. Finger pointing is also universally negatively received. Unfortunately the whole video is centered around him forgetting the third Federal Department he wants to omit ...so this nonverbal pearl is overshadowed by his memory lapse. Notice how when it came time to name the third department, while his thumb and his index finger were fully extended - showing his commitment and demonstrating the strength of his opinion - his middle finger did not become fully lengthened - but only half so. It mirrored his memory. His conscious mind couldn't remember the Department of Energy. He had nothing to commit to - so his subconscious mind reflected this lack of commitment-confidence. If he had only forgot for a second instead, and then recalled it, his third digit would have become fully extended. But he didn't.... Rather his other finger and thumb curled up to match it. If people count on their fingers and yet they don't fully extend them - while their words may say they're certain and confident - DON'T BELIEVE THEM. Watch their fingers. At 0:16 Perry pointed at his temple. People very often touch or scratch this particular region when they're trying to recall something. Rick demonstrates that very well here. Ron Paul makes the mistake of turning towards Perry. This gives Perry more credibility than Paul should want to give. After all - it's a debate. Paul makes a further mistake too. While holding up all five digits (presumably trying to say he thinks five Federal Departments should be cut) - he shows Perry five digits. Then he does the same to the audience. He held up the back of his hand to Perry while showing the audience his palm. This should have been done in reverse. Showing someone your palm is considerably more offensive and disrespectful. Paul should seek to demonstrate respect for the audience while making his point - and also dismissing Perry. Most people cringe when they see the gesture of the palm-forward-claw as Paul showed us/the audience. At 0:30 - 0:35, when anchor/commentator John Harwood says, "....Seriously....is the EPA the one you were talking about or....?" Notice Harwood's forehead muscles contract, wrinkling his forehead and elevating his brow. When another's forehead/eyebrows take this formation upon asking a question, there is a very high probability they already know (or believe they know) the answer to the question which THEY ARE ASKING. It maybe obvious and sarcastically-rhetorical, but it is often camouflaged. Depending on the context and what other nonverbals are clustered with it - this may also indicate incredulity. At the 0:45 - 0:50 mark, when Gov. Perry is again trying to recall the departments he would cut, he looks down and to HIS left. Right handed people will very often look in this quadrant when trying to choose the correct words, phrases, syntax, etc. After 0:50, Perry looks straight down at his notes, but the Department of Energy is not to be found. At the 0:57 - 0:58 mark, Perry shows us a great subtle expression of Contempt. The left side of his mouth elevates in what may look to some as a partial-half smile. There is also some mild nasal dilation. The object of his contempt is most probably himself.